Over a year ago Bin Laden was finally killed...now imagine if we had to keep killing him over and over again because Muslim mad scientists had cloned him...94 times. That's essentially the premise of this 1978 thriller except that in 1978 nobody ever heard of Al Quaeda or Bin Laden..instead the monsters they cloned were mini Hitlers. Today we know humans can really be cloned but two other things render this film believable...one character is a real historical figure..Dr. Josef Mengele was the famous "Doctor of Auschwitz" who used concentration camp prisoners as guinea pigs in his medical experiments. One involved injecting dye into the brown eyes of children to turn them blue like Hitler's. It's eerie to look at some of the children in the movie..dark-skinned South Americans with bright blue eyes. (They reminded me of the children in a 1960's horror movie called Children of the Damned). Also the world has known for years that the surviving nazis hid out in South America. They could be plotting anything but these days they'd have competition from Islamists (who in my opinion make Hitler look like Jesus). Nazis would not be crazy enough to drive a plane into a building and blow themselves up along with the passengers. 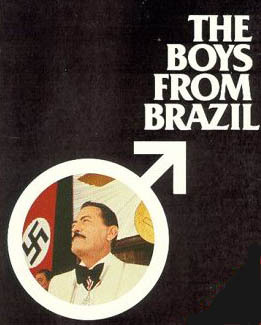 Interestingly the title is The Boys from Brazil (as is the Ira Levin novel its based on)but the action takes place in Paraguay. The film opens with a Jewish American college student Barry Kohler(Steve Guttenberg)in Paraguay. He witnesses a thriving neo-Nazi community complete with a parade of goose-stepping soldiers. Among the vintage nazis hiding out there is none other than Dr. Mengele whom nazi hunters have been chasing for decades. With a rigged up bugging device (probably considered high tech in 1978)he plants at Mengele's residence Barry records them discussing a plot to revive the Third Reich. Before he hears the entire plan he is caught and killed, but not before playing the tape for and mailing photos to famous nazi hunter Ezra Lieberman (Laurence Olivier). Lieberman travels through Europe and the United States following clues until he discovers the terrifying Nazi plan. If there is a flaw in this movie it is the overacting of Steve Guttenberg. He just much too happy for a Jewish boy who knows he might be caught by the nazis. Gregory Peck makes up for Guttenberg's poor acting skills..you can tell he's having the time of his life with the part of Mengele at the end when he excitedly describes how he took blood and skin from Hitler for his experiment to create "...the right Hitler for the right future...tailor made for the 1980's, 90's, 2000!" Now if only someone would have thought about cloning ELVIS! !